Once you’ve been to Italy nothing compares to the authentic food, the wine and the hospitality there. We were really craving authentic Italian food one lunch time and I particularly wanted a pizza. Now I certainly know what Italian pizza should be like as I did have a go at pizza making in Naples, which you can read about here. It has made me a little fussy. I had read that there was a new Southern Italian restaurant in Islington, which is a short drive from where we live, called Radici by chef Francesco Mazzei and so we decided to give it a go. As we entered the vibe was a fun one, and there were lots of families dining there, lots of laughter and happy smiles, and the decor was casual and I adored the distressed and rustic light colour theme. It looked like a proper Trattoria. There is an open kitchen where you can see the pizzas being made too, which I absolutely loved. Wine was of course ordered, and if it is going to be red it is definitely going to be Montepulciano and this one was delicious. I was amazed at how reasonable the prices were on the menu considering the chef behind the restaurant, and I knew that this would become a really popular restaurant, not just for us, but for people seeking that perfect Italian meal. To start with we shared pizza, olive oil & rosemary bread as well as a board of Italian salumi & cheese. But the choices were amazing and we struggled to narrow it down without the risk of ordering everything! The bread was particularly incredible with olive oil to dip it into. Just heavenly! I could have gotten carried away ordering starters but had to seriously restrain myself. For mains, we both decided to go for spicy options, and Amit picked the spicy chicken calabrese. The waiter had also recommended it and it was really flavoursome, with just the right heat kick and he devoured it all. He was really glad he ordered it as he had been toying between this dish and a pizza. Plus it meant I got to try it too. He had never tried chicken Calabrese before and hopefully it has ignited a desire to travel to Southern Italy! 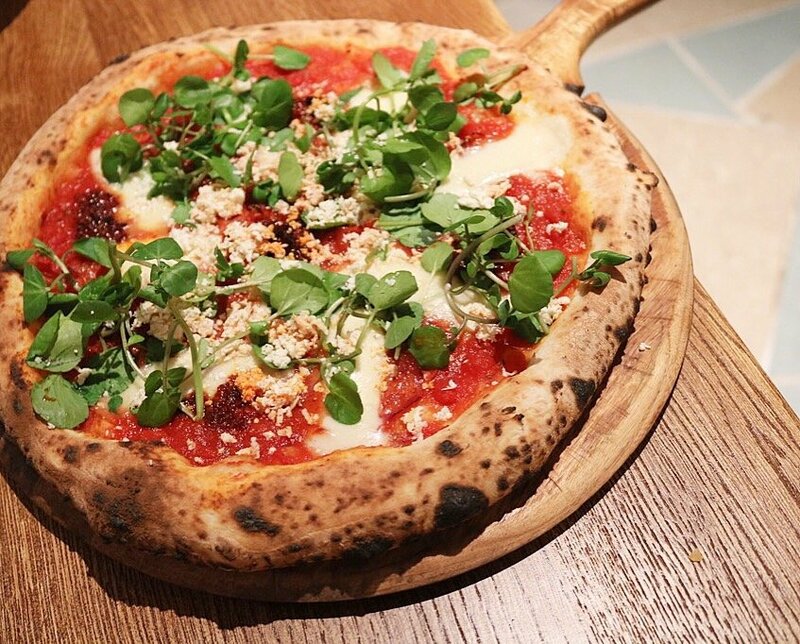 I got my pizza fix with a calabrese, ‘nduja and chilli pizza and it was everything I had hoped it would be, and took me right back down memory lane to my holiday in Italy. It had that lovely burnt crust that I adore and just tasted sublime. If you are craving proper Italian pizzas, these more than ticked the box. It was made in a proper pizza oven, clearly the right way, and the dough was so soft and dreamy. If you like spicy food, this pizza was pretty chilli but not too much that it killed the flavour. Instead it had a really addictive taste. For dessert we opted for lemon sorbet for a refreshing hit as it was a particularly balmy day, and this was so zesty, decadent and certainly perked us up. The dessert choices were just as fabulous as the rest of the menu. There was so much I wanted to try on the menu and I loved the vibe in the restaurant so will most definitely be back soon. I would highly recommend it as the service was fantastic, the food was incredible and the prices were so so reasonable! We had Sunday lunch there and it was perfect to spend a lazy Sunday afternoon, with delicious wine and food to match. There were lots of vegetarian and non-vegetarian choices on the menu and a really extensive well balanced selection. I do love a good Italian! That pizza looks so good! The crust looks the perfect amount of crusty and chewy at the same time, heavenly. Love Italian food – so great to know of a such a find! Thanks Binny!